Significant advances have been made in our understanding of how the brain and spinal cord are wired and their capacity to rewire after injury and disease as a result of activity-based therapies. Not too long ago, rehabilitation was thought to be compensatory, teaching the body to work around the functions lost. However, we now understand that rehabilitation is a key part of recovery with well-documented changes that range from standing and stepping to improved health and quality of life. Given the shift in the field, new rehabilitation strategies have emerged, among them Locomotor Training which is used for people with brain and spinal cord injury, stroke and other neurological disorders. Many individuals living with spinal cord injury, regardless of time elapsed since their injury, experience improvements with walking after receiving Locomotor Training in research programs and clinics across Germany, Canada, Switzerland, and the United States. Although it is not widely available in clinics in the United States, it is standard therapy for people with an incomplete SCI in Germany, Norway and Switzerland. The Reeve Foundation's NeuroRecovery Network® offers Locomotor Training across its network of clinical centers and community fitness and wellness facilities. The NRN was originally conceived by Christopher Reeve who believed in the power and potential of therapies like Locomotor Training to expedite recovery following a spinal cord injury. Participants in the NRN become part of a network-wide database to accurately measure the impact of Locomotor Training and other interventions. Locomotor Training is based on our current knowledge of how the brain and spinal cord control stepping and how the nervous system learns a motor skill. The ultimate goal is to retrain participants to stand and walk again. 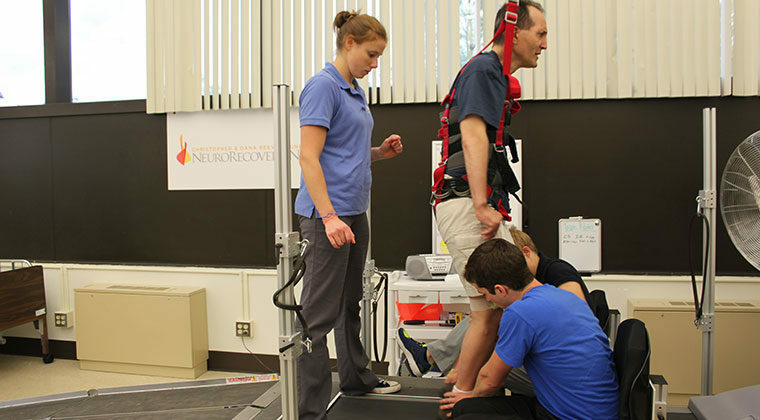 Step training utilizes body weight support on a treadmill (BWST), in which a participant is suspended in a harness over a treadmill while specially trained therapists and technicians move his or her legs to simulate walking at a normal pace. The idea behind step training is to help the nervous system relearn motor patterns associated with walking. During step training, sensory information from the legs and trunk is repetitively sent to the spinal cord. The sensory input comes from the actual stepping, from the manual contact of the therapist on the participants and from the contact of the sole of the foot on the ground. The therapist ensures that the participant is building their motor skills through standing and walking. As the participant improves, the assistance of the therapist is reduced. The same training principles and skills acquired in step training are then transferred to the overground walking training and community ambulation phases. Overground walking training takes the nervous system’s new capacity to the overground environment. In this setting, specific limitations to independent walking including gait deviations are addressed. Community ambulation training implements principles that will help participants meet the overall goal of the program: safe, effective, and independent mobility in the home and community. Although no two people respond to therapy in exactly the same way, all NRN participants have seen improvements as a result of Locomotor Training. These changes range from stepping and standing, to enhanced health and well-being. For some, health improvements include increased cardiovascular and pulmonary function, increased bone density, decreased spasticity, a decrease in the likelihood of skin lesions and improved glucose intolerance.